Love, distrust, family, ghosts… just a few topics Haunted Souls touches on. Emily and Brett had a fling 4 years ago. They decided to end the fling due to his deployment. What neither realized was Emily was pregnant. Fast forward, Emily is a single mother of a son named Tyler. Brett’s deployment is over and he finds out he is a father. Tyler makes a friend with ghost name Josiah. There’s hurt, angry, and fear. Can the 3 (technically 4) save each other? I wasn’t sure what to expect, but what I can say… I truly enjoyed the story I got! It was difficult to walk away from this story. Both Brett and Emily showed such a vulnerability which made you feel for them and root for them. You completely understood their feelings toward each other and the emotions they were dealing with. Their relationship was complicated, yet had an ease to it which made you want to grab one of them (and at times grab the other) and give them a little shake. While this was a GREAT second chance romance, this was also a really good ghost story. I was slightly surprised with myself that I enjoyed this aspect of the story. I, generally, don’t like horror, but this element added to the story and showed me different sides of this story and the romance. Kathryn Knight’s writing isn’t overly complicated, yet it isn’t simplistic by any means. She can write and twisted, yet beautiful story of love and forgiveness, you’ll feel like you’re right in the middle of the action. 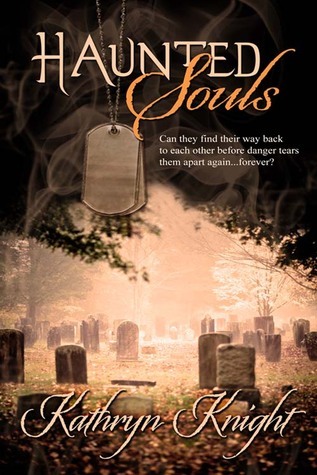 I recommend Haunted Souls to anyone who loves complexed and damaged characters who you’ll love. So glad you enjoyed Haunted Souls! Thank you so much for the wonderful review! It was my pleasure! I enjoyed Haunted Souls very much!